Thanks to everyone who helped make Solstice Stars a smashing success! 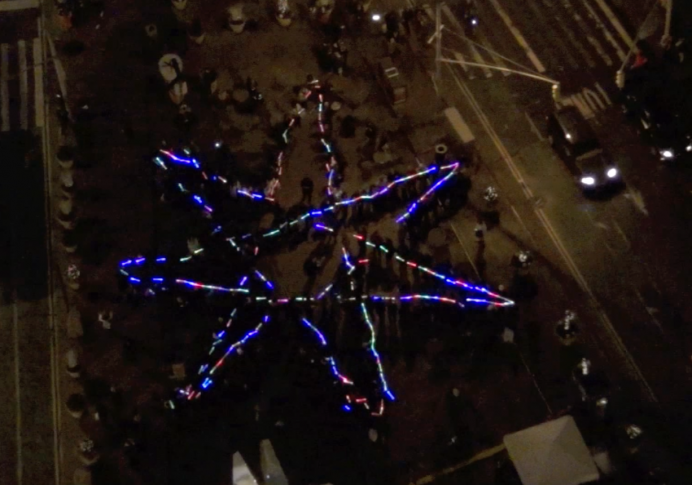 Over 350 participants created an amazing 20-meter heptagram to commemorate the geometry of the winter solstice in New York City (see the video from the top of the Flatiron). Scroll down to see more about the mathematics of this event, on this page below the pictures. 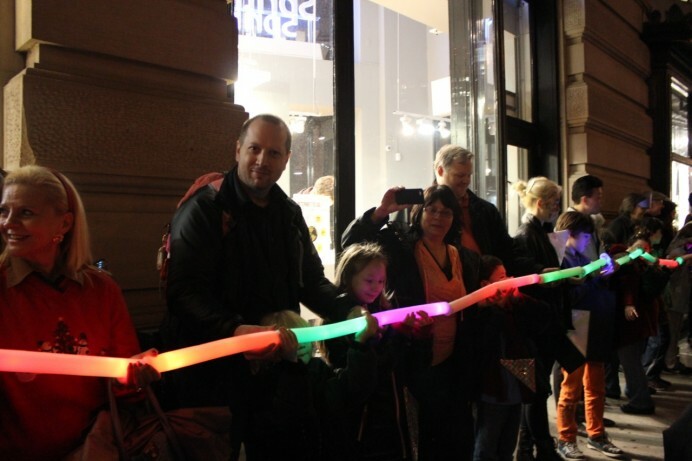 MoMath wants to thank the Flatiron/23rd Street Partnership and Macmillan Publishers for their generous help. Watch MoMath’s website for how to become part of the next MathHappening! You may be wondering, “Why a heptagram?” To get some insight into that, consider the geometry of the solar system. At noon on the equinox at the equator, the sun is directly overhead; in other words, it makes a 90° angle with the horizon. As you move to higher latitudes, however, the greatest altitude of the sun decreases, by one degree for each degree of latitude that you travel. Hence in New York City, at 40.7° latitude, the highest that the sun reaches in the sky on the equinox is an angle of 49.3° above the horizon (49.3 because 90 – 40.7 = 49.3). Now, if the axis of rotation of the Earth were perpendicular to the plane of the solar system, that would be the whole story. But as the fact that we have seasons tells us, and as illustrated in the bottom right picture below, that axis of rotation is actually tilted — by 23.5°. Therefore, when the hemisphere you’re in is tilted toward the sun (summer), the sun appears higher in the sky; and when it’s tilted away from the sun, the sun appears lower in the sky. This event took place on 2015 December 22, the winter solstice when the Earth’s axis of rotation is pointed directly away from the sun in the Northern hemisphere, and so the sun’s highest point in the sky for the day is the lowest of any day in the year: only 49.3° – 23.5° = 25.8°. That’s where the heptagram comes in. The points of a heptagram divide the circle into seven equal parts. But the angle at each point is half of that, because an inscribed angle is half of a central angle. So the angle at each point of a heptagram is 360°/(2*7) = 25.7°. 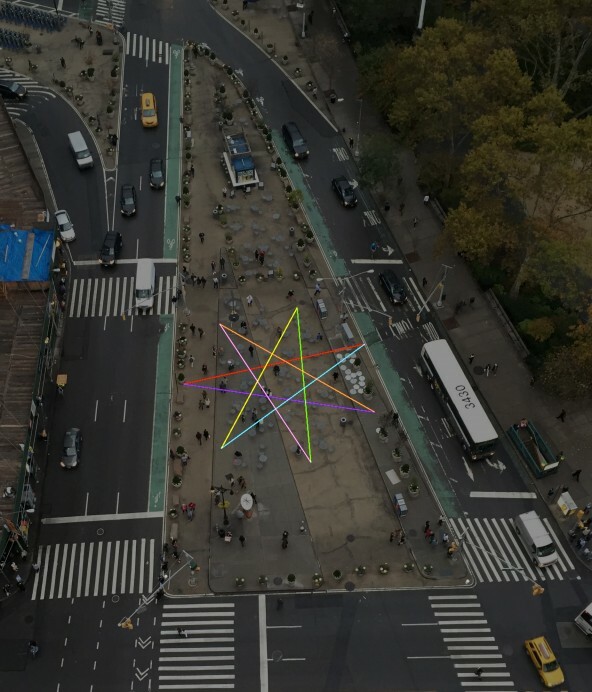 Since the angle of the points of a heptagram is within a tenth of a degree of the highest point the sun achieved over New York City on the solstice, MoMath thought that bringing hundreds of people together to create a glowing heptagram would be a great way to observe the solstice. 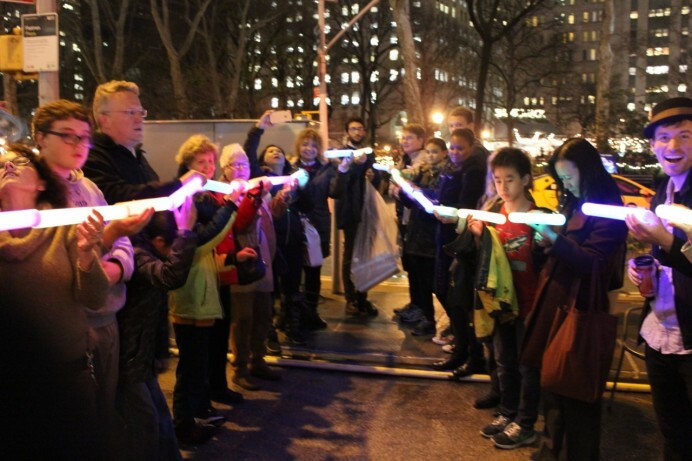 Joining its other MathHappenings like Pythagorize the Flatiron or the Pi Day of the Century, MoMath together with the Flatiron/23rd Street/Partnership created another giant group celebration to commemorate the Winter Solstice with math and light. The group formed a heptagram — a seven-pointed star with angles just under 26 degrees, representing the highest angle the sun reached over New York City on 2015 December 22, Winter Solstice, which is the shortest day of the year. DAVIDsTEA provided warm drinks on the plaza. This special mathematical celebration was part of the 23 Days of Flatiron Cheer organized by the Flatiron/23rd Street Partnership, and formed part of its food drive to share some cheer with others. 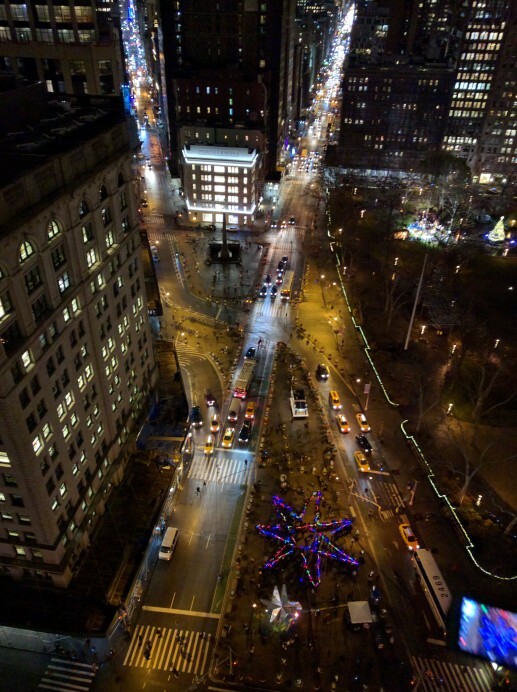 Solstice Stars took place at 6:30 PM on December 22, at the Flatiron North Plaza (23rd between Broadway and 5th). Read more about Solstice Stars in the New York Times.